For use with the Clearblue Fertility Monitor with, or without, Touch Screen. 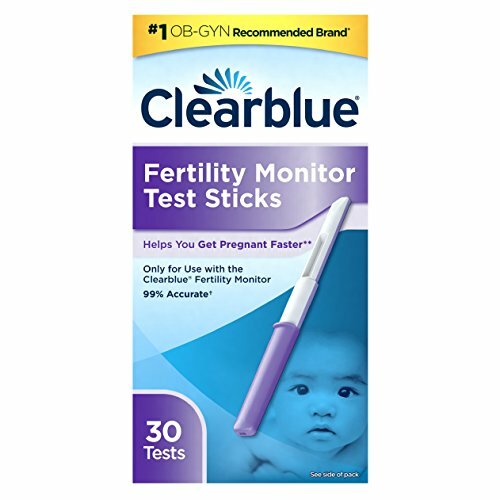 The Clearblue Fertility Monitor Test Stick pack includes 30 individually wrapped test sticks. The majority of women who are trying to get pregnant will need 10 test sticks each cycle. Women with irregular or long cycles may have to use 20 test sticks each cycle. The Clearblue Fertility Monitor comes from the #1 OB-GYN ovulation recommended brand*** and is the most advanced method to help you maximize your chances of getting pregnant. It's designed to identify all your fertile days**, typically up to 6, which is more days than traditional ovulation predictor kits. This discrete, feminine, handheld fertility monitor tracks two key fertility hormones, estrogen and luteinizing hormone, it shows your fertility information on the easy to use touch screen as well as summarizing up to 6 cycles data on one screen for easy comparison. Instructions- Please read the enclosed instruction insert before using the test sticks. The Clearblue Fertility Monitor Test Sticks are an essential part of the Clearblue Fertility Monitor. No other Test Sticks can be used with the Fertility Monitor. No other test sticks can be used with the fertility monitor. Monitor sold separately. This package contains 30 fertility monitor test sticks. The majority of women will need 10 test sticks in each cycle. English and Spanish instruction inside. Store in a dry place below 86 degrees F (30 degrees C). Do not freeze. For in vitro diagnostic use. The Clearblue Helpline is available to answer questions between 8:30 a.m. - 5:00 p.m. Eastern Time Monday - Friday. Call us toll free at 1-800-321-EASY (3279). The Clearblue Fertility Monitor is the most advanced home monitor that's designed to identify all your fertile days**, typically up to 6 each cycle. Suitable for women with cycles 21-42 days long. If you have any questions about this product by Clearblue, contact us by completing and submitting the form below. If you are looking for a specif part number, please include it with your message.